The partnership was finalized in the County Seat of Hofheim, during a ceremony held in the parliament, in which (L-R) Chairman Scott K.York (Loudoun), Chairman Berthold Gall (MTK) along with political collogue from Mr. York, Mrs. Lori Waters attended. 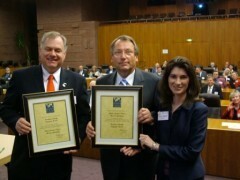 In 2006, the partnership with Loudoun County had been approved by the parliament. The official ceremony occurred on October 27, 2006, with Chairman Gall and the Chairman of the Loudoun Board of Supervisors, Scott K. York signing the documents. An extensive exchange program for students has existed for several years. A Student Partnership Exchange Program (SPEP) was developed together with both counties participating. During their two-week trip to the partner county, students stay with quest families and as part of "Work Shadowing" program, get an impression of life in a foreign nation. In the course of the past years, requests for participating in this program have continually increased. Economic promotion and development, renewable energy sources and traffic management, have become central themes of interest. With the George-Marshall Society, the formal county boundaries have been expanded, to now include the local nearby regions. The Main-Taunus County (MTK) is situated in central Germany, within the Rhine-Main area, between Frankfurt/Main and the Hessian State capital of Wiesbaden. A total of approx. 320,000 individuals live within twelve cities and communities, with the county seat situated in Hofheim. The country is blessed with a strong economic base and in an outstanding location, situated in the middle of Germany's industrial region, the city of Frankfurt and the Frankfurt International Airport only a few miles away, with numerous freeways nearby. The strong multi-fold economic base of the Main-Taunus County is due to the variety of businesses situated here. Many company headquarters are found in Eschborn, while Bad Soden offers a well known Spa, the fruit-growing region in Kriftel, the forests in the Taunus valley with its medieval castle in Eppstein, along with the romantic waters of the Main river and vineyards in Hochheim and Flörsheim which regularly produce its world famous Rheingauer Riesling wine. The "Route of Industrial Culture", a regional park, along with the "green belt" around the city of Frankfurt offer nearby areas of relaxation. The educational opportunities of the children are provided by 54 schools inside the county. Within the MTK County, approximately 1,100 Americans live and work for some 130 U.S. companies that are here represented. The partnership with Loudoun County is understandable with strong connection to America that the MTK area offers. This fact is underscored with the largest American Consulate General facility in the world situated in Frankfurt/Main as well as one of the major remaining U.S. military garrisons, situated in Wiesbaden. More information can be found in the Internet at www.mtk.org. Located approximately 30 miles Northwest from Washington D.C., Loudoun County covers an area six times the size of MTK, with 320,000 inhabits. The area was settled by German immigrants during the 18th century and for a short period, Leesburg, VA, served as the nation's capital. The mainly agricultural region experienced an economic boom, with the construction of the nearby Dulles International Airport, in 1960. The economic base dramatically changed, with the arrival of numerous aviation related companies and services, which established themselves since, bringing much prosperity to the region. The vineyards of the county are still an important economic commerce of the area. Loudoun County is one of America's fastest growing regions, with not only the lowest unemployment rate in the state, but also in the nation. 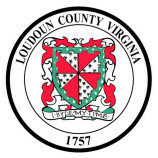 The partnership between the MTK and Loudoun Counties is understandable when considering the numerous common elements, such as population size and economic base that exist. Several companies also have established these strong relations, especially with the German family ties amongst former immigrants. Since the Dulles International Airport is nearby, travel between the two counties is simple and fast. The Capital City is in close proximity and the environmentally protected National Parks of the Blue Ridge Mountains and Shenandoah River, as well as the historically important remnants of the American Civil War nearby, offer the tourist many nearby attractions. Within the county, is the former home of the General of the Army and former Secretary of State George C. Marshall, father of the European Recovery Program, better known as the Marshall Plan, can be found in Leesburg, VA.
More information about Loudoun County can be found on the Internet at: www.loudoun.gov.